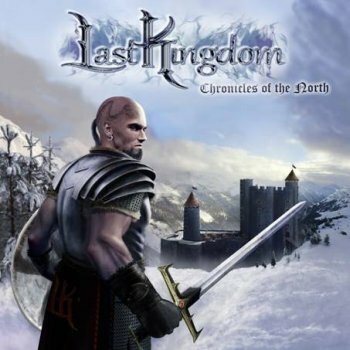 LAST KINGDOM - CHRONICLES OF THE NORTH (CD) | Online Shop | Wizard LTD. Album: "CHRONICLES OF THE NORTH (CD)"
Thanks to the Volvo Trucks company, the international Metal brotherhood can welcome LAST KINGDOM. The Swedish band from Gothenburg was practically formed on the Volvo production line, when two young Swedes happened to be working together and discovered that they were not only both huge fans of Helloween but were also taking their first steps in the world of musical experience in local bands. After a long journey of finding themselves, "Chronicles Of The North" is the result of that first meeting. Their style combines driving, melodic Power Metal components with symphonic keyboards, pleasing and multi-faceted vocals without relegating the most important weapon in the heavy metal artillery, the guitar, to the background. The keyboard-guitar combination dominates the album, which admittedly does not provide any new styles, but which is played down to the last detail with blood, sweat and a love of heavy metal. LAST KINGDOM make a solid statement that is equal to the standards of Stratovarius, Thunderstone, Blind Guardian and Cain's Offering. "Chronicles Of The North" is a solid, often driving Melodic Metal Album with symphonic parts and compact melodies. The proximity to understandable melodies is a hugely important aspect for LAST KINGDOM and they do not lose sight of this in any of the nine songs on the album. All nine tracks suit each other perfectly and give us an overall picture of a band which knows what it wants to achieve and what it can do best: brilliant Melodic Metal with symphonic/hymn-like elements. And that is what "Chronicles Of The North" is all about!